BitSaver is not all that great. In fact, this suspicious application is just another advertisement-supported program which should be deleted immediately. If you have allowed the installation of the program yourself, you probably thought that it could assist you with online shopping and savings. If you pay attention to the information on bitsaver.info, this is how the application should work. Unfortunately, this is not the case, and the best thing to do is to remove BitSaver as soon as possible. Justplugit engine is used for the development of BitSaver, and other infamous advertisement-supported software, including BetterPriceChec, FlashCoupon, FlexibleShopper, etc. As you can tell by the names of these programs, all of them are represented as online shopping assistants. Nevertheless, if you do not delete these applications, they will attack your browsers with suspicious, maybe even unreliable offers. This is the same reason you should delete BitSaver from the operating system as well. Once installed, BitSaver can access your data on all websites, access tabs and browsing activity, and manage apps, extensions, or themes. This activity is quite intrusive; however, it is not known whether the application could use tracking cookies to collect and leak sensitive information. If you want to avoid this risk, you need to remove BitSaver cookies. Of course, we recommend that you delete all files, cookies, and terminate all processes related to the suspicious application, primarily because the program is not useful at all. In fact, instead of assisting you, the extension could disrupt your virtual security. 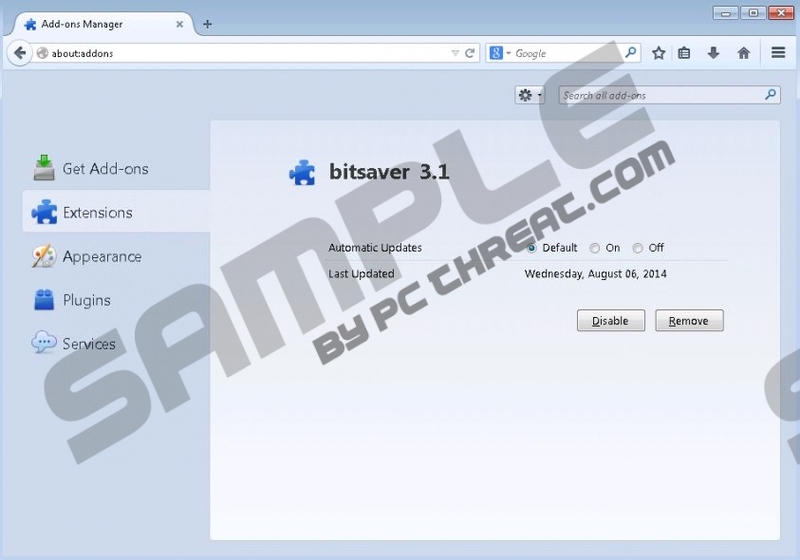 It is now believed that InstalleRex installers represented using fictitious offers are the most commonly used tools for the distribution of BitSaver. These installers are not only misleading but also highly unreliable. If you launch the installer and pay no attention to the presented information, you may accept the installation of highly unreliable and possibly dangerous applications. Make sure you remove them from the operating system if they do exist. Use malware installers if you are struggling with the detection. You can delete BitSaver in several different ways. You can perform the manual removal using the steps listed below. Make sure you delete the application from the computer and the affected browsers. Unfortunately, this is not the best option if other malicious programs are running on the PC and if the operating system is not safeguarded. In this case we suggest the installation of automatic malware removal software which will delete BitSaver without any trouble. Click the Start icon on the Task Bar to access the user menu. Access the Metro UI menu, right-click on the background and choose All apps. Open the browser and simultaneously tap keys Ctrl+Shift+A. In the Add-ons Manager menu go to Extensions and Remove the undesirable one. Open the browser, simultaneously tap keys Alt+T and select Manage Add-ons. Select Toolbars and Extensions and Disable the undesirable plugin. Open the browser and simultaneously tap keys Alt+F to open a menu on the right. Select Tools, then Extensions and find the undesirable plugin. Click the trash icon and finally choose Remove. Quick & tested solution for BitSaver removal.